In the fall of 2006, Professor Brad Davis joined Koepke to co-teach the class. 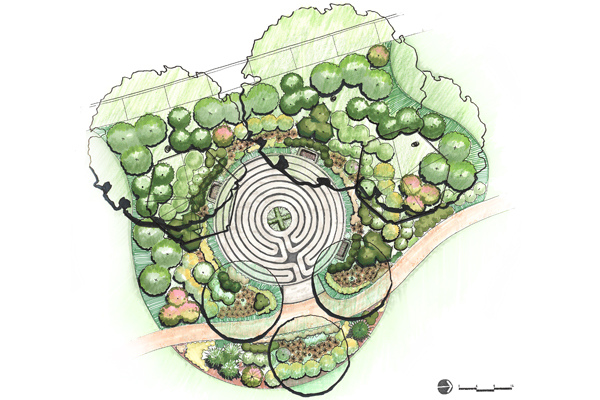 With funding available and construction opportunities impending, the Center needed a more detailed plan of the Meditation Garden and Labyrinth. Davis volunteered to continue working on the Labyrinth phase of the project, enlisting graduate student Thomas Baker to develop more detailed construction and planting plans for the area. Initially, the client wanted the labyrinth path to be the width of a wheelchair. After conducting a case study and showing the client the different layout options, it was decided that a prefabricated concrete paver labyrinth design was more feasible. The planting design was also a major portion of this project. 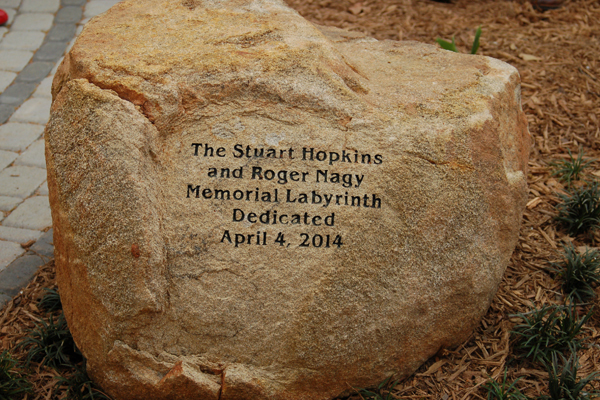 The labyrinth was purchased and installed in October 2013 with memorial funds in recognition of Stuart Hopkins and Roger Nagy. 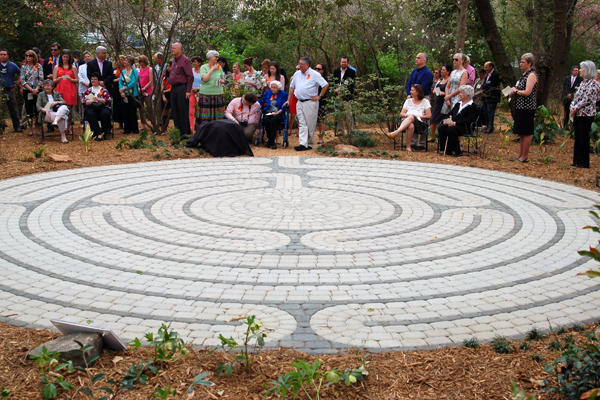 The labyrinth is an example of how the Healing Garden is a sacred space to encourage healing and recovery from loss and grief. The labyrinth draws both patients and people from the surrounding neighborhood with its appealing shady environment. Tell me a little bit about the Loran Smith Center for Cancer Support and your work as director. Living with cancer, its treatment, and long-term impact often entails much more than most people imagine. The Loran Smith Center was started in response to expressed needs of cancer patients. They were seeking additional information and support services to help them cope with the physical, social, and emotional impact of cancer treatment they were experiencing. Our services are based on research showing the value of psychosocial support and complementary therapies for cancer patients at any time in their cancer journey. Our professional staff includes an oncology social worker, oncology nurse, and a program coordinator, each of whom help to navigate our clients to resources and programs that best meet their needs. Expert facilitators in healing therapies, expressive arts, yoga, and mind-body medicine are also employed to provide the broad array of programs found at the Center. I have been part of the Center for 3 years and am able to witness first-hand the powerful impact our services have on cancer patients, their families, and caregivers. What was the motivation behind the labyrinth garden? What made you a believer in the healing/meditative powers of labyrinths? 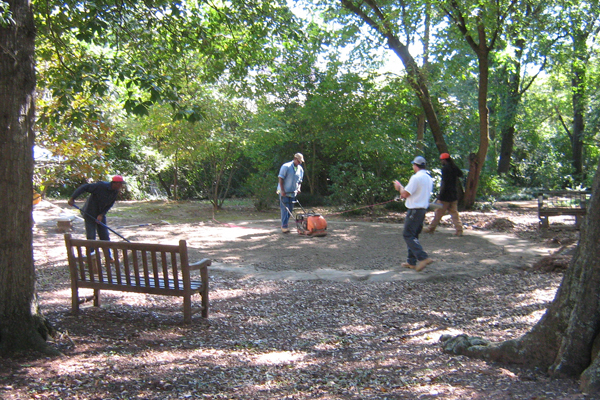 Installing a labyrinth was part of the original vision for the Center. 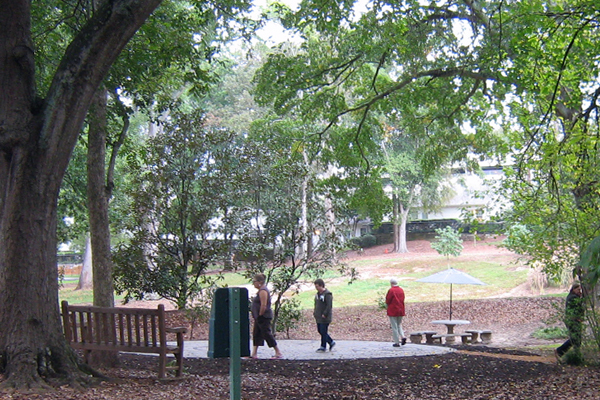 In fact, many of the early landscape plans generated by UGA’s College of Environment and Design included a labyrinth in the garden adjacent to the Loran Smith Center. Mona Taylor, the Center’s founding director, recalls that the garden area was walked by spiritual elders and blessed with the intention of becoming a healing space for all who entered it. A labyrinth was a natural fit for achieving that intention. Unfortunately, those plans were put on hold while other priorities were addressed. I have walked labyrinths before and found them to be an excellent tool to quiet the mind and open the heart. They are an ancient design and found widely throughout the world in representations across major religions. So I know my experience is not unique. When it comes to use of the labyrinth by our clients, I believe it is not our job to heal people, but to create the space, intention, and compassionate presence that encourages the physical, spiritual, and emotional healing of each individual. The healing garden and labyrinth help create those conditions. When I became the director in early 2011, I heard about the early plans and was immediately taken with the idea. I sought to renew our partnership with UGA. Professors Brad Davis and Marguerite Koepke led their students on the project, and the plans, including those for a labyrinth, were updated. We were fortunate to receive memorial donations in the names of Stuart Hopkins and Roger Nagy, along with a generous grant from the Vaughn-Jordan Foundation, that ultimately resulted in the recent installation of our labyrinth and the landscaping around it. 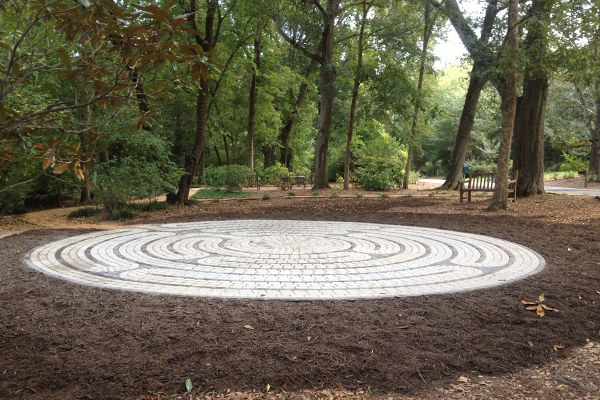 How have patients responded to the recent completion of the labyrinth garden? Our clients have been delighted with the addition of this new garden feature. They use it as a rest between programs and some have been guided on it as part of a resiliency workshop. Moreover, the labyrinth draws people from across the neighborhood, the hospital, and the community, with its wonderful appeal. I have seen people walking with slow deliberate steps and I’ve witnessed a hospital team darting playfully around its twists and turns on a break from their planning retreat. The healing garden is truly becoming a place for recreation in every sense of the word. If you were to start this process all over again, what would you say to the landscape architects to help improve their work/profession? I would say, “work with each of your clients the way you worked with us!” Our process was completely collaborative. The landscape architect listened well to us to ensure that the final plan truly fit with our vision, our values, and our sensibilities. In what ways did you find landscape architecture students helpful or not helpful throughout the design process? The students were effective at opening us to ideas we had not previously imagined. There is something wonderful about giving over a creative process to a group of students without serious expectations for what the outcome absolutely should be. Our students presented to my stakeholder group on two occasions; each time, we were thoroughly impressed with the range of ideas presented and the unique interpretations we heard and saw. That allowed us to move forward with excitement as we began to make decisions on final plans and timelines. How did graphics/renderings help with marketing and fundraising? There is nothing that compares to a well-executed graphic of a proposed project when it comes to influencing the opinions of a client. In the case of our labyrinth, two different renderings were offered that endeared viewers to the project and also prompted donations to fund it. 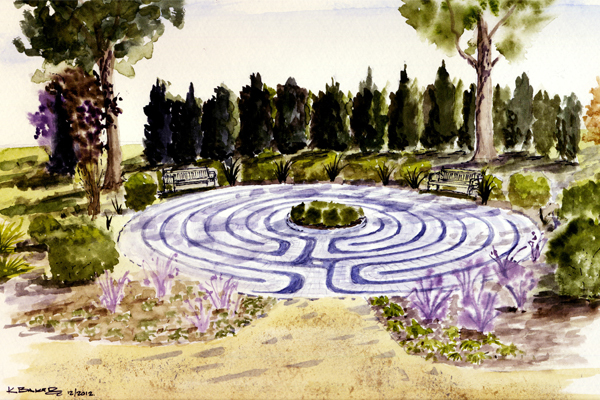 The small, simple, but powerful watercolor rendering of our labyrinth played a significant role in how our group conceptualized the Meditation Garden. The painting emphasized the creation of privacy using landscaping to give the feel of being in a room while walking the labyrinth. As the plantings grow, the desired sense of solitude will also grow. The garden remains a work in progress, not unlike each person who walks the labyrinth. Previous Article Heading to the Beach this Weekend? A wonderful addition to our Healing Garden is getting special attention. 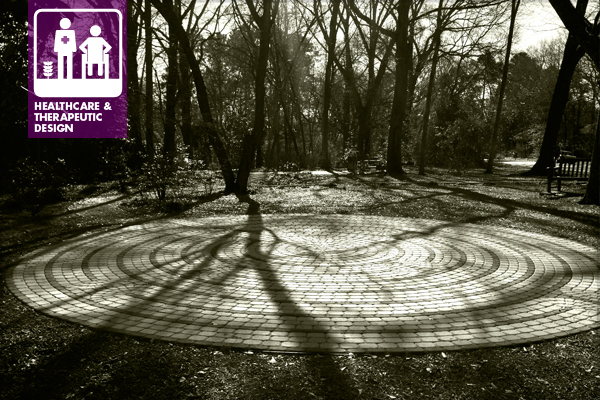 We’re honored to have the American Society of Landscape Architects feature a blog about the Labyrinth near our Loran Smith Center for Cancer Support.